Polymeric biomaterials for nerve regeneration. Structural and dynamic response of neutral and intelligent networks in biomedical environments. Surface-erodible biomaterials for drug delivery. 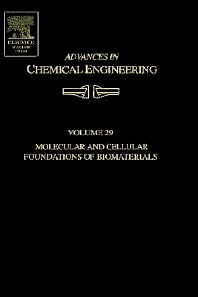 This latest volume in the Advances in Chemical Engineering series, is a contemporary analysis of the preparation, structure and properties of biomaterials with emphasis on the molecular design and material/polymer interactions. The book addresses cell-biomaterials adhesion, biomaterials and gene therapy, protein adsorption, platelet and white cell activation processes, molecular design and surface modification of novel biomaterials. Intitute of Biomaterials and Biomedical Engineering, Department of Chemical Engineering and Applied Chemistry, University of Toronto.